The pounding of horses' hooves shattered the night's silence. Harriet froze in the shadow of a tree and peered out into the darkness. She barely dared to breathe as three slave catchers came to a halt only a few feet from her hiding place. Had she escaped from danger so many times only to lose her hope of freedom now? At age six the sharp bite of a whip taught Harriet Tubman what it meant to be a slave. 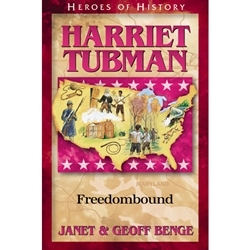 The other slaves scoffed when Harriet resolved to escape north someday. Little did they know that this girl would one day lead hundreds of slaves to freedom on the Underground Railroad.